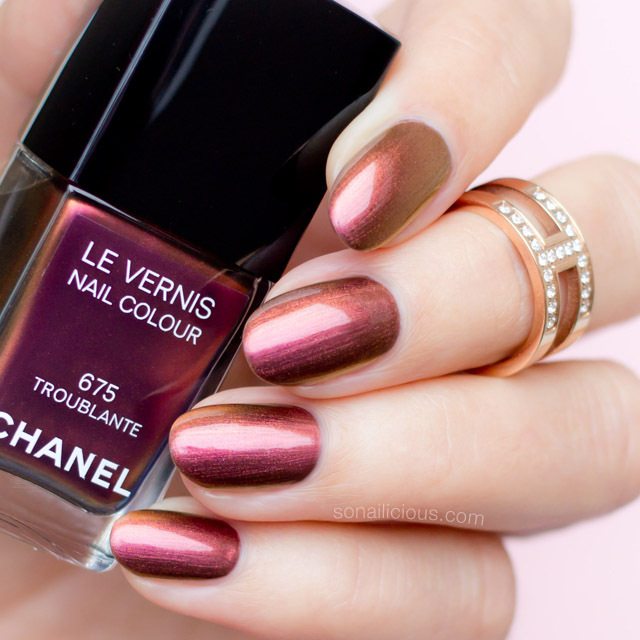 The limited edition Chanel Troublante Le Vernis is one of three colours from the Rouge Allure Winter 2015 Collection. I missed out when it was first released in Australia, so imagine how happy I was to spot it at DJ’s Chanel beauty counter when doing my post-Christmas shopping. Even though it’s summer in Australia, I treated myself to this Autumnal Chanel stunner. Plus, it’s a true multi-chrome, how could I resist? Sound intriguing? Read the review below! Formula: 5-free. Fast drying and highly pigmented. It’s on the thinner side formula-wise, so you’ll need at least 2 good coats to get Chanel Troublante fully opaque (3 thin coats pictured). Application: The consistency wasn’t too thick or thin so you’ll be able to apply it easily. Keep in mind the fine shimmer may result in some visible brush strokes so you need to apply it carefully and slowly. Aim for the 3-strokes method. 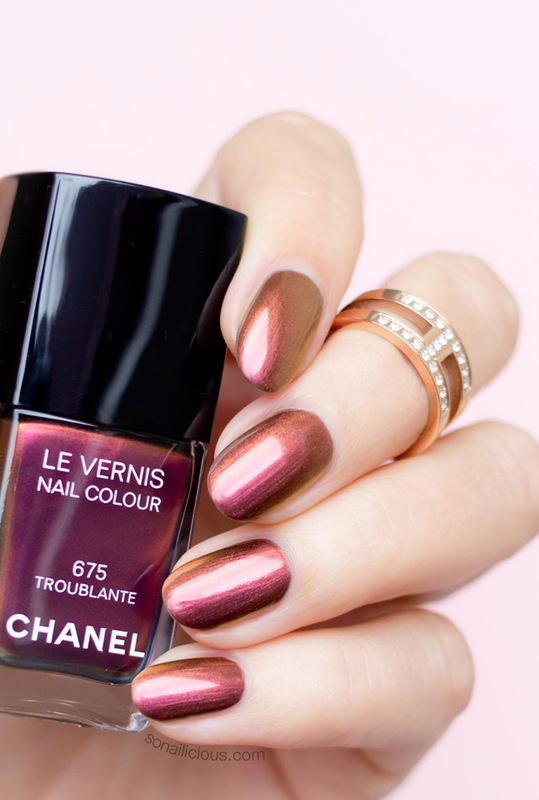 Also, make sure your nails are perfectly smooth because like any duochrome, Chanel Troublante highlights the tiniest imperfections. Finish/Colour: A pink-shimmer copper multi-chrome that shifts from bright bronze to light coppery gold and deeper, richer red-bronze with a strong metallic shimmer effect. The polish looks brighter, almost raspberry red in direct sunlight. 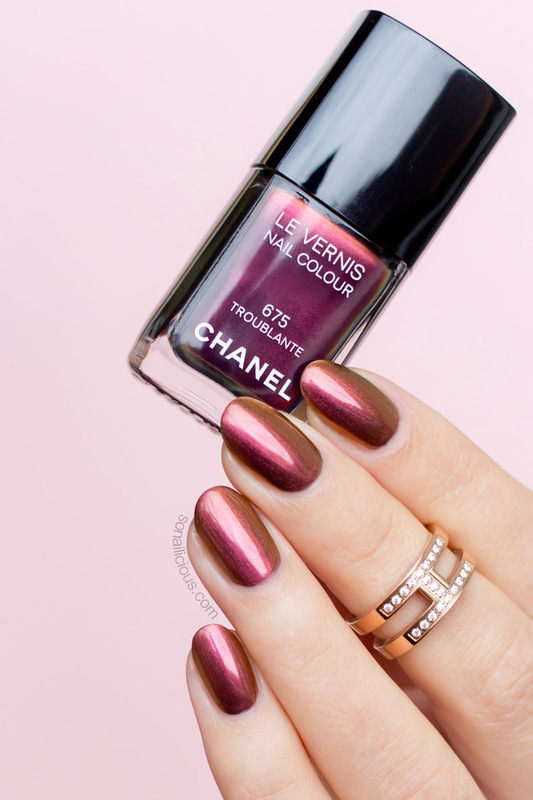 Chanel Troublante’s chameleon effect is so strong the colour shift is even noticeable in the shade. 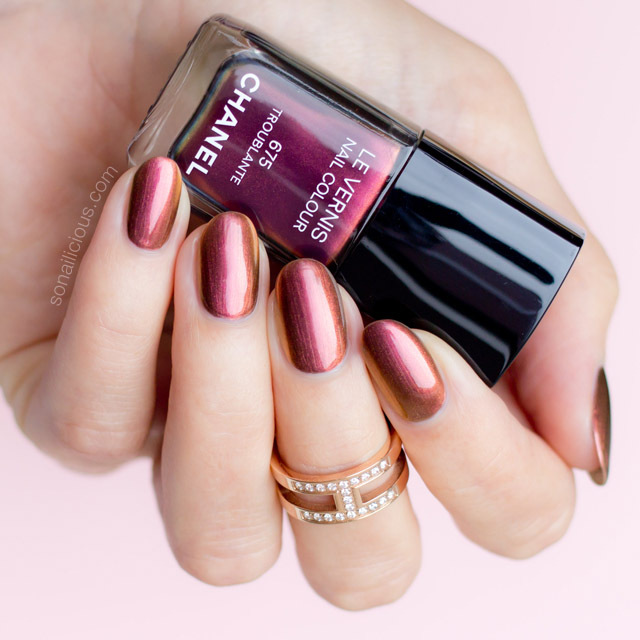 Dupes: There are no close dupes – Chanel Troublante sits somewhere in between Dance Legend Boo and Roz. Wearability: Lasted for 7 days with top coat. 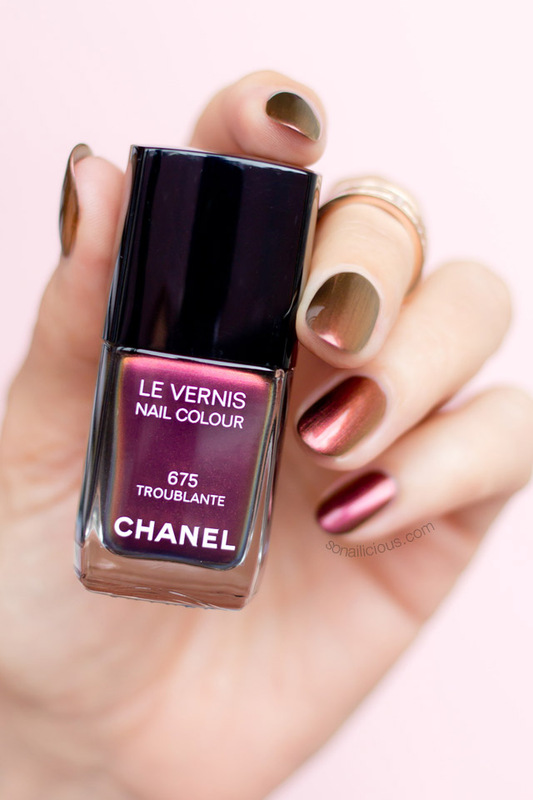 Judging by the longevity of the 2015 Chanel nail polish launches, they have finally improved their formula. It’s now incredibly long-lasting! 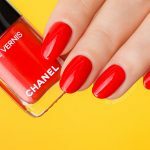 Nail Art: Chanel Troublante looks very beautiful on its own, but if you want to try some nail art, here’ a few great nail design ideas with chameleon nail polish. Overall Impression: Chanel 675 Troublante is a beautiful and unique chameleon nail colour with a strong shimmering effect. The ever changing colour will look flattering on any skin colour and the flawless, long-lasting formula makes it perfect for any occasion or nail art. There are no dupes for this lacquer! In my opinion, this is an absolute ‘must have’ for any polish lover. Availability: Chanel Troublante, US $27 is sold out online but keep checking here and here (you might get lucky like I did). Good news for our Aussie friends, it’s still available via DJ’s AUS $39.00 – here. Wearing: Rose Gold Knuckle ring. So, what do you think of this unusual multi-chrome nail colour? Will you invest in Chanel Troublante?